Cabernet Sauvignon by Teusner of Barossa Valley. . . .
Teusner Wines came into being late in 2001 when Kym Teusner witnessed a conversation between his girlfriend’s uncle and his brother. They were discussing the viability of an old Grenache vineyard, planted in the Northern Barossa Valley by their grandfather. The low yields and low prices being paid by the ‘Big Boys’ meant that the vineyard was running at a loss and was facing certain destruction! Kym was loath to hear this and approached his brother in law, now business partner, to see if they could scratch together enough cash to keep these gnarled old vines in the ground. In that first year they raised enough capital for only about a quarter of the fruit from that vineyard, but this was enough for the Riebke brothers to stall their plans for these precious old vines. They were aware of a few other old blocks that fruit could be sourced from, if required, and made the first release with 165 cases of 2002 Joshua. In addition to this about 8 hogsheads of Grenache, Mataro and Shiraz was put aside, destined to be released around 24 months later as Avatar. Kym Teusner is an enthusiastic winemaker, a graduate from the University of Adelaide with a Bachelor of Science (Oenology Major). He was always focused upon returning to the Barossa and experimenting with Rhone varieties that grow so well there. Once finished his studies, this drive led him to work with several high profile producers of Rhone style wines whilst working on the launch of his own label. Viticulturalist Michael Page grew up on his family vineyard in the south Australian Riverland town of Barmera. In his early 20s he purchased his own 30 acre plot of old vines and consistently produced fruit worthy of top bonuses. The 1990s took their toll on this venture, and when growers started getting paid for their fruit in brandy spirit Michael decided it was time to look to greener pastures. He began developing vineyards for other people which led him to settle in the Barossa Valley. 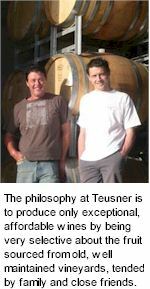 The philosophy at Teusner is to produce only exceptional, affordable wines by being very selective about the fruit sourced from old, well maintained vineyards. These vineyards reliably produce balanced, complex fruit which is handled, with minimal inputs, into wine. The sources are predominantly family and close friends, which allows great selectivity in which fruit is ultimately vinified.